When it comes to armored fighting vehicles, there is always a tradeoff between vehicle size, weight, ammunition, gun calibre and armor protection. This is really important when it comes to medium calibre guns and infantry fighting vehicles (IFVs): armor penetration, lethality against infantry, rate of fire, ammunition load and the availability of a large amount of ammunition at the gun are indispensable factors for a well performing IFV. Balancing all these factors is critical, but hard to achieve. Different countries have come to different solutions in accordance with their doctrines. Increasing the gun calibre will lead to a higher lethality against infantrymen and most likely increase armor penetration (although the actual pressure, penetrator design and barrel length matter here too). However the rate of fire and the ammunition stowage will most likely be reduced. Using an anti-tank missile launcher will increase costs and weight of the vehicle, but allows the usage of an autocannon with lower penetration. In the end choosing the main armament of an armored fighting vehicle (AFV) should be considered as an optimization problem: How can one make the AFV most lethal for a given weight and size (and cost)? In order to take the different effectivness of the different calibres into account, the amount of "stowed kills" is measured or estimated. The idea behind this is rather simple: one compares the lethality (using different metrics like armor penetration, after armor effects or the amount and spread of fragments) to the amount of ammunition stored inside the vehicle and at the gun. The Combat Vehicle 90 (CV90) is a great example for the positive and negative impacts of larger calibre ammunition, due to the larger amount of different guns adopted on it. The CV9040 uses the 40 milimetre Bofors L70 gun, the CV9035 the 35 milimetre Bushmaster III autocannon, the CV9030 the 30 mm Bushmaster II autocanon, the CV90105 prototype light tank a M68E tank gun and the CV90120 with a 120 mm Compact Tank Gun from RUAG. The CV9040 has a total of 24 rounds available at the gun (three rows of eight rounds) with a further 24 rounds being located in a carousel magazine used as ready racks. The CV9035 has a total of 70 rounds available at the gun, consisting of two belts a 35 rounds. The CV9030 has a total of 160 rounds available at the Bushmaster II gun. This clearly shows the benefit of utilizing smaller calibres in combat vehicles. While the CV9040 has only 24 rounds directly available at the gun, just by using the slightly less powerful 35 x 228 milimetres calibre the amount of rounds available at the gun is nearly tripled. The 30 x 173 mm calibre still more than doubles the ready ammunition compared to the 35 mm calibre! Given that the 40 mm Bofors gun currently does not offer more armor penetration possibilities, the Bofors compares unfavourably to the Bushmaster guns. While the actual armor penetration of the 40 mm Bofors with APFSDS ammunition is higher, the added armor penetration does not allow engaging heavier armored targets: all three claibres can defeat current generation IFVs frontally and MBTs from the side - the only advantage gained by the larger calibres is additional ranges, which only matters under limited circumstances. Including the 48 rounds stored in the turret, a CV9040B has a total combat load of 234 rounds of 40 mm Bofors ammunition. A CV9035 has storage options for a total of 203 rounds of 35 mm ammunition. The lower number compared to the version armed with the Bofors gun is the result of the less optimal ammunition storage and the belted ammunition. The most ammunition is stored in a CV9030: up to 400 rounds of ammunition, nearly twice as much as on the other versions, can be stored inside the vehicle. The CV90105 TML carries 40 rounds of 105mm ammunition inside the vehicle. The CV90120-T carries 45 rounds of 120mm ammunition. The CV90105 TML and the CV90120-T however require a larger crew of 4 soldiers and have lost all infantry carrying capactity, so the ammunition load for an IFV version with 105/120mm gun would have been drastically lowered. While the total ammunition stowage of a CV9040 is actually higher than that of a CV9035, this is related to the different gun design: a dual-belt fed externally powered gun loaded with belts of 35 rounds is larger but also a lot more capable than a 40 mm Bofors L/70 gun. Above is a graphic from CTA International showing the advantages of their "space efficient" 40 mm Cased Telescopic Armament Systems (CTAS) gun. This graphic illustrates nicely how the gun size is affected by larger calibre ammunition, albeit it is a bit "unfair" and biased. The 40 mm CTAS is not fitted with any sort of gun mantlet protection, whereas the Bushmaster III gun at least is fitted with one. The Bushmaster guns are all externally powered guns and are including parts of the ammunition feed mechanism, whereas the 40 mm CT(AS) gun's external powered motor and feed mechanism are not shown completely. The CTAS gun is at least quite larger and heavier than the 30 mm RARDEN and 30 mm Mauser MK30 guns, which are/were used in the original versions of the Warrior and ASCOD vehicles to be equipped with the CTAS gun in British service. The Canadian Army and the US Army both did reject upgunning their LAV IIIs and Bradley IFVs respectively to a higher calibre, because of the lowered amount of "stored kills". The Canadian military also pointed out that a larger gun due to the limited amount of ammunition has to be used differently - the 25 mm Bushmaster gun of the LAV III was "used like a machine gun" by firing short salvos. This is not really possible with larger calibres due to the increased size and therefore reduced combat load. Figures from the US Army Research Laboratoy on investigating the adoption of a 35 mm gun on the Bradley come to the results pictured above: While a standard 35 mm point-detonating high explosive (HE) round has a higher lethality per round than a 25 mm HE round, the actually amount of stowed kills is considered to be worse at short to medium combat ranges, where the smaller fragmenting effect of the 25 mm HE round doesn't matter as much, because the accuracy is still very respectable. Only at longer ranges - i.e. above 1500 metres/one mile - the 35 mm point-detonating HE ammunition is favourable. Depending on terrain and combat scenario this can be satisifactory or not - during the Cold War the average combat distance in Central Europe was considered to be less than 1500 m, which means that a 35 mm Oerlikon or Bushmaster gun does not offer more lethality against infantry in this situation. As the figures from the test and simulations made by the US Army Research Laboraty show, programmable ammunition can greatly increase the lethaliy against infantry. Programmable ammunition also can provide considerable better results when used against aircrafts, main battle tanks (by damaging all optics) and infantry hidden in structures (by exploding within the building). As the current electronics and fuzes required for programmable ammunition cannot be fitted into small calibres such as 20 mm and 25 mm ammunition without reducing the payload beyond to an unreasonable small amount, calibres of 30 mm and above have gained popularity. As far as armor penetration is considered, this is always a trade-off depending on the user's doctrine: it mostly comes down to a simple design decision: For what targets will the main gun of the vehicle be utilized and against which targets are other (and better) weapon systems available? The CV9040 was designed with rather specific requirements, which are not shared by many other countries. The 40 mm Bofors gun was chosen for a number of reasons:the same calibre was already in use with the Swedish Navy and was used for anti-aircraft weapon systems (including the CV9040AAV self-propelled anti-air gun later developed, based on the CV90 chassis). A major factor however was the demand to penetrate the side armor of (ex-)Soviet main battle tanks such as the T-55 and T-72: these tanks have 80-90 mm thick steel armor over the sides of turret and hull, penetrating this with a 20-30 mm gun at medium ranges and certain angles of impact is not possible. The Swedish requirements however saw no adoption of an anti-tank missile system on the CV90; the main gun was intended as sole weapon to engage enemy armor and thus the demand for armor penetration was high. Other infantry fighting vehicles like the M2 Bradley, AMX-10 and Marder are designed with less emphasis on main gun penetration, as the autocannons were only intended to defeat infantry units, APCs and IFVs. For heavier armored targets these vehicles were equipped with anti-tank missile launchers that offer greatly improved penetration even over a 40 mm gun and can be effectively used against a wider variety of targets (thanks to the availability of multi-purpose warheads for modern ATGMs). 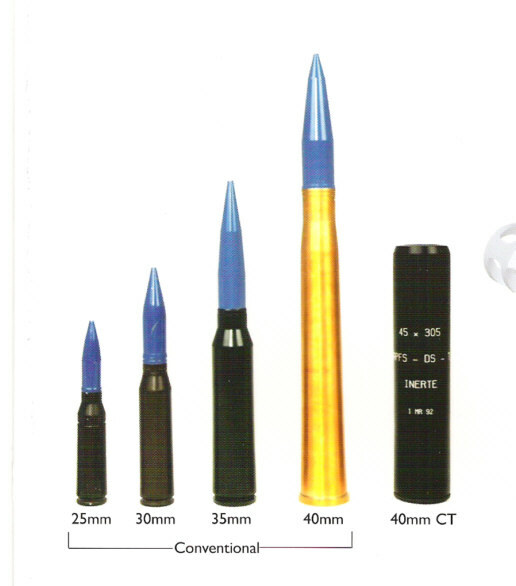 In a presentation on the 40 mm CTAS gun, the manufacuters implies with a graphic, that three rounds of the new 40 mm case telescopic ammunition have the same lethality as 21 rounds of 20 mm or 30 mm ammunition. Unfortunately the resolution of the image is poor and it seems to be the result of photoshop work. However the total combat load of vehicles fitted with the CTAS gun is really poor, which means despite being optimized for being "small", the stowed kills of a Warrior or Scout-SV with CTAS are still limited compared to other IFVs with smaller guns and missile launchers. This shows that bigger guns are not always better. Excellent post! I've linked to your article on my blog and it is developing alot of discussion. Well done! Thanks for linking! I hope my future post will be able to meet the same quality. Excellent post. Love your blog. Keep up the great work. Your blog is excellent and I have been enjoying reading what you have written a lot so far. BTW the BMP-2 actually carries 500 rounds for the 30mm cannon. The CV90 exists and was designed with AT-missiles in mind. One of the reasons why the turret has a bit of an off-set is supposed to be due to this. A reason why the BILL2 variant never has been adopted is said to be that the crews get more defensive in their action when they have missiles. But the most likely reason should be cost vs seen benefits. The cost is also most likely the reason for why the CV90, in Swedish service, got the Bofors 40-mmm. There is some information floating around that Sweden/Bofors has been looking into developing a Bushmaster that fires the 40 mm round used by the Bofors gun. If my memory serves me, this is thought to increase the armor penetration of the AT-rounds with around 20%. There are a number of reasons why an ATGM was never integrated into the CV90 and why the 40mm gun was picked. An early plan called for a mixed fleet of 25 and 40mm vehicles and the 25mm Bushmaster was evaluated. However it was determined that 25mm had a low probability of developing advanced new types of shells because it is so small. That combined with the existing know-how of the 40/L70 in the armed forces and industry plus the mentioned requirement to defeat tanks in the side made the 40 a clear winner. As for ATGMs you have to keep in mind that Sweden looks totally different from the German plains where WWIII was supposed to take place. The median combat range is below 800 meter even in the reasonable open south. Most of the rest of the country is covered by forest or cities. Thus there are few places where an ATGM can be used to it's full potential but a cannon is always a cannon. And there is of course the cost. ATGMs are not cheap and neither is their integration into a vehicle and given the downsides I've already covered the cost could not be justified. I had seen a simulation of a Bradley taking on a T-72 in Kuwait and ineffective. I wondered about the inability to mess up the aiming end and it just sitting there rather than maneuvering. Then it occurred to me about side penetration and maneuvering and a 25 mm not being able to do that. Is the 30 mm now being put on Stryker a reasonable option and can it up its game to penetrate at least side Armor of a T-72? Awesome Blog! I've always wondered why militaries sometimes opt for an IFV with a smaller calibre main armament. Thanks to you I now know why and it makes heaps of sense. Keep in mind "stowed kills" generally refers to another vehicles, Canada found that the LAV's need significant amounts of ammo to reduce each grape hut, however 1 rd 105mm HESH would destroy it. So destroying bunkers/building, a round with a large amount of HE is required, destroying APC's/trucks/IFV, can be done with the smaller calbre weapons.